I think that we had two consecutive days of spring-like weather so far and in those brief 48 hours I got a twinge of spring fever and took the kids out for their spring portraits. Usually I leave the portrait studio disheveled and in a full sweat after organizing otherwise chaos into four simultaneous smiles. I tried a new studio this time and was quite pleased at my mental state when the shoot was complete. 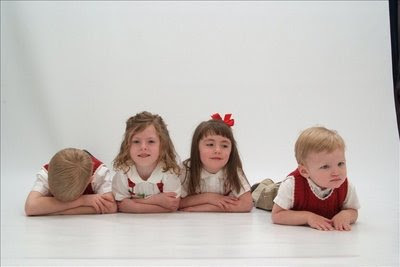 Our previous studio had the policy that a child could not pose in a chair unless they could sit independently. Can you imagine how interesting an individual portrait of little Bear at the age of 3, 4, 5. . . laying on his back would be? Not quite the pose I was hoping to capture. Our new place was wonderfully receptive to my sitting support strap that we concealed under his sweater. This was the first real photo session I have had with Bridger in a while and I left with tears in my eyes from laughing so hard. It only took 208 images to capture a handful of print-worthy ones. Every time we laid the kids on the ground next to each other for a tummy shot, Bridger assumed the facial expression of Speed Racer (but with the speed of an inch worm) and would immediately crawl himself out of the shot. Lance insisted that I buy some of these for the comic memory it is to us. What makes me smile the most, however, is the portrait posted at the top of the blog entry (one of our few "keepers") and something that nobody else would ever notice in looking at Bridger's hands. 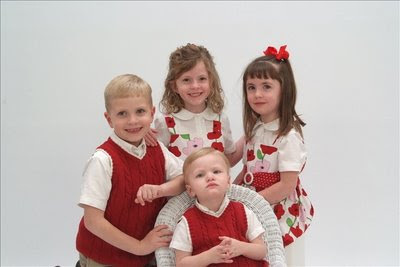 The photographer kept telling the kids to say "cheese". Every time she did, Bridger, who never would smile at the camera, kept signing "cheese". So his little hands in that picture are obediently complying with her orders. He simply amazes me! Many of these are useless signs -- strawberry will really not help us for a while. He doesn't eat strawberries, doesn't touch strawberries, but that is his favorite sign that he makes sweet "yum-yum" sounds with. Just like you have to have a careful ear to interpret the "toddler speaks" language, the toddler sign dialect requires a careful eye to translate. After working on 3 signs with him for six months with hardly any measurable success -- he is now acquiring approximately 2 new signs a week for the past several weeks! Through all my efforts, I have to remember my new proverb: That Bridger will do what Bridger will do when Bridger is ready to do it. But for now, when taking pictures, I will have to think of a new smile cue.